If you’re suffering from back pain of any type, you probably want to stay in that easy chair and not move. However, that may be the worse thing that you can do. In fact, you can exercise away back pain in most cases. When you exercise you increase circulation and help build core muscles that can build strength and relieve the pressure that causes the pain. Be aware that not all exercises are appropriate if you have issues with your back. Abdominal crunches, double leg lifts burpees may actually exacerbate your condition. That’s one reason you should always check with your health care practitioner and let your personal trainer know about your condition. The right type of exercises can actually help relieve back pain. Laying on your back and bringing one knee to the chest and alternating is one good exercise to help relieve back pain. Knee twists and wall squats also address the issue. Upper back pain gets good results from pectoralis stretch to scapular squeeze. In many cases, when you find the right exercises to reduce pain by stretching the tightened muscles and providing a massage like result. Don’t discount seeing a doctor for some types of back pain. Pain that’s constant and won’t allow you to sleep or that leaves your legs tingling, weak or numb should be investigated first. If you find your back pain is accompanied by bladder or bowel issues, you need to see a doctor. Back pain after a major trauma, like a car accident or falling down the stairs, should never be ignored and neither should back pain that’s accompanied by a fever. If you have chronic back pain, start a program of exercise to build core muscles and improve posture. If you’re overweight, it can add to back pain, plus pain in your lower joints. Exercising not only helps reduce back pain by strengthening core muscles, but also can help you shed those extra pounds. Seek advice of your personal trainer or your health care provider for exercises to strengthen your back and improve your overall posture. Get more exercise, eat healthier, quit smoking and lift with your legs, not your back. Lifting with your legs means you’ll feel most of the pressure in your legs, not your back. If you have back pain, try stretching, rolling the shoulders, arching the back and other movements that help identify the problem. You’ll often feel some pain, but it shouldn’t be debilitating. If it feels unbearable, stop! Many of the exercises for lower back are done laying on the floor. Have a yoga mat or other type of mat available to do those. Check your clothing to see if it adds to back pain. Clothing that’s too tight and restricts movement can cause it. High heels, heavy purses and even keeping your wallet in your back hip pocket can cause back pain. Good posture is imperative if you want to alleviate back pain. Exercise can help with that, too. 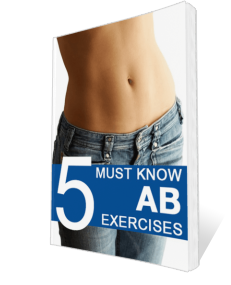 Strong abdominal muscles are just as important as strong back muscles when it comes to relieving back pain.